DesignBox will place at your disposal many tools to speed up your work. Do you feel frustrated, annoyed? Is success your goal? Then you want to use DesignBox to change your image effects, batch resize, rotate, mix a watermark, convert format, make GIF animations, create iOS icons, Generate QR code or draw your shapes as you please. Do you enjoy designing stylish and elegant men or beautiful girls? You may be a photographer, so you owe it to yourself to try this software tool. With a single click you’ll have at your disposal hundreds of picture styles, dozens of filters, be able adjust the lightness, contrast, saturation, sharpness, HUE and RGB colors of your work! Make use of Lightness, Contrast, Saturation and Sharpness effects to compose and arrange your pictures just the way you want them. 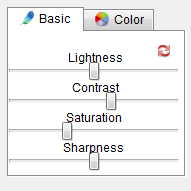 Use the slide bar to adjust the HUE and the RGB color of your pictures. Build your images to give them a warm or cold effect, and adjust their colors if needed. 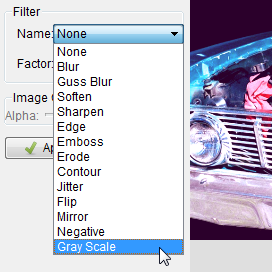 You can apply and use dozens of filters, including Blur, Soften, Gaussian Blur, Sharpen, Edge, Emboss, Erode, Contour, Jitter, Flip, Mirror, Negative and Gray Scale. Pick and choose from hundreds of picture style templates. 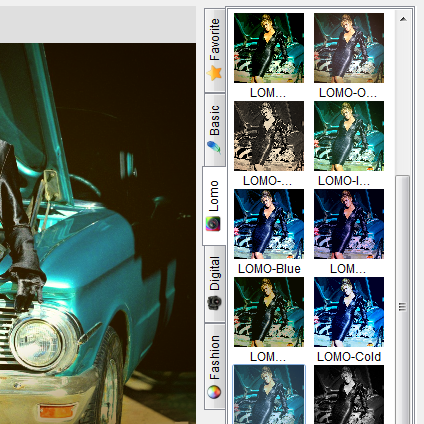 Additionally, you have access to basic effects, lomo and fashion style, and other digital studio effects. You’ll be amazed at your options! 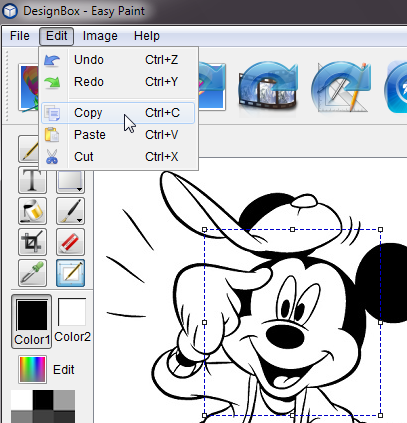 With the painter tools, easily and freely draw your cartoon shapes and designs. To draw shapes, just use pencil, brush, or spray freely. The line, rectangle and circle tools will help you create regular shapes, and with the crop, eraser, color picker, paint pail you will be able to make needed changes easily. What about if you want to use Text? No problem, go ahead and use the Text button to change the font, make it bold, italic or both. So that your designs follow your goals, the Tool Box offers you many options, including Pencil, Line, Text, Rectangle, Circle, Paint Pail, Brush, Spray, Crop, Eraser, Color Picker, and Select. You can rotate your images 90°CW, 90°CCW, or 180° and then flip your images vertically or horizontally. 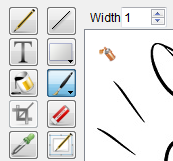 Select any area on the canvas, and then copy or cut it. Paste any images held in your window’s clipboard. 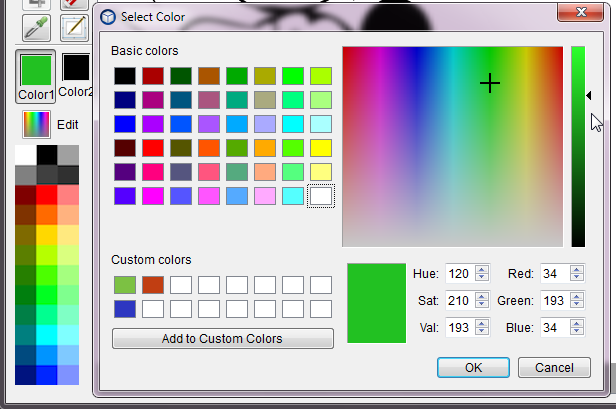 Foreground and background colors are easily set, or if you need to, select the color bar or click the Edit button to choose additional colors from the color library. Using the batch mode, easily adjust the size of your images, rotate them, add a watermark, or rename and export them. Importantly, to batch convert all your images with a single click, you can batch convert them by selecting the multiple or all options. Your images can be exported in several formats: JPG, PNG, BMP, TIF, TIFF, TGA, XPM, XBM, and PPM. Choose several pictures or add a folder to rotate them, change their size, add watermarks, or rename and convert them to many image formats. 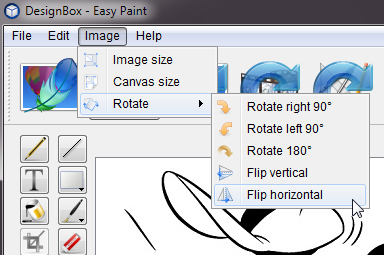 Rotate your images 180° 90°CW and 90°CCW, and then choose to rotate them vertically or horizontally. Resize and crop are at your disposal. Aspect ratio can be maintained; you can change your image size, or crop an image from any area on your picture. Select you text or image to watermark. 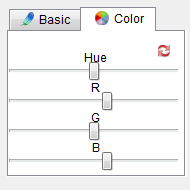 Set the font and color of the text, or select an image to mix it. Watermark position, rotation angle and transparency can also be set. Use this format: “newname####” and set the start number. Use the batch mode to change file names in any sequence. Export your image in the original format or select JPG, PNG, BMP, TIF, TIFF, TGA, XPM, XBM, or PPM. Set the quality and save to your location. Easily create GIF animations with any set of pictures. Add your image sequence in a list, set the GIF width, height, image delay and then export it. The ability to create GIF animations with or without background is very satisfying and rewarding. GIF Maker allows you to remove or add background color. Add a folder or image sequence to create your images’ list. Use any image format to create GIF animations. Set the GIF size, or resize your images to keep the aspect ratio or change to a fixed width and height. Set the 1 picture delay time from 0.01s, use the loop function, select the low or high GIF quality, and then preview it. Export your GIF with or without transparent background. Remove or mix the background color. Quickly generate QR codes with Text, URL, Phone number, Email, SMS, Contact, GEO, WIFI, Event, etc. Convert your business card, label, or design watermark to QR code. Send your QR code to your friends through SMS, WIFI, GEO, or URL. 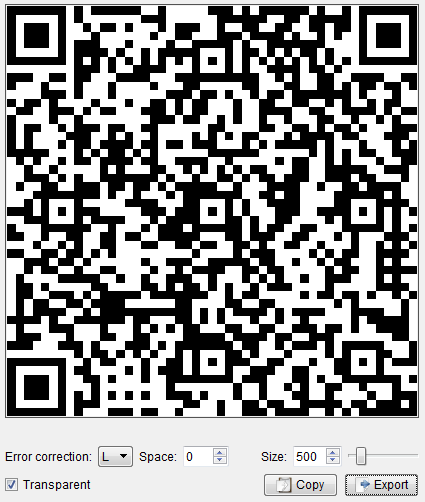 Using your Android or iPhone, scan and read the information contained in QR codes. Export your images in PNG, JPG, BMP, SVG, TIFF, etc., formats. Generate QR code with Text, URL, Phone number, Email, SMS, Contact, GEO, WIFI, and Event. Receive error corrections, set space, size, and transparency. Copy and paste to other software; export your images to PNG, JPG, BMP, SVG, TIFF, etc. Efficient SVG viewer and batch convert tool. SVG image is a major vector format for the next generation of websites, and it’s the preferred format for HTML5. Practical SVG View and Convert Software. Easily select folders, or use thumbnail display mode. Quickly preview SVG pictures or convert them; supports SVG and SVGZ. Select any area from the SVG, then export with the same quality and size, and batch convert SVG to tiff, png, jpg, bmp, gif, tga, xpm, ppm, xbm, and pdf. Select the SVG area as you wish and set the export size and quality. Easy folder selection and thumbnail display mode. Quick preview of SVG pictures or convert them; support for SVG and SVGZ. Convert SVG to PNG, TIFF, TGA, PDF, BMP, XPM, XBM, PPM, and GIF. Make a SVG list, then set your export format, quality, and path to save. In one single sweep convert a large number of SVG. Easily generate iOS icons and include different size pictures or a iTunesArtwork file. To create an icon for your app, you need to have an image. iOS icons, however, need multiple files and each file has a different name. Using this tool, all you need is 1 click and you’re done! It’s the best tool to generate iOS icons. After you’re done creating an icon for your App, in a single sweep you’ll be able to generate all needed files for iTunes App Store and iOS. You can create an iTunesArtwork file, and generate all the files, each with its unique name, for the App Store and iOS.